The UAE is such a safe zone that my Warmshowers host does not lock his apartment door. It makes it easy for his many touring cyclist guests to come and go without the need of dealing with locks. He was off for the weekend in Bahrain with his girl friend when I arrived at his apartment wrapping up my travels, so I could walk right on in and make myself at home, just as I had when I flew into Dubai a month ago. Scott is a touring cyclist himself when he gets time off from his job teaching at an Australian school in Sharjah, right next door to Dubai. 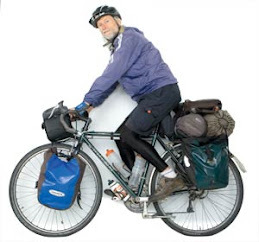 With all the good karma he is accumulating from hosting touring cyclists he can count on a lifetime of tailwinds. Within twenty-four hours of my arrival two other cyclists pulled in fresh off the ferry from Iran, a young German and an older Portuguese, both traveling independently. During my previous stay, I shared his quarters with a young man from Hong Kong. All had been on the road for at least six months and had months ahead of them. They all brought a warm glow of contentment to the apartment. It was no wonder Scott has provided a haven for such souls. I had a day-and-a-half wait for my flight home. 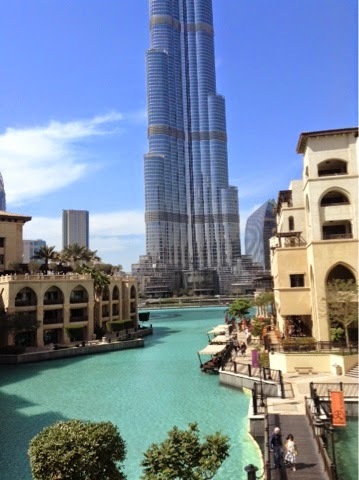 I took advantage of it to visit a few of the places I had missed at the start of my trip during the first two stages of the Dubai Tour. I was curious if the traffic would seem less daunting after experiencing extreme doses of it in Muscat and Abu Dhabi. I didn't have to resort to my GPS device as often as I did a month ago, but the unrelenting traffic was still as much of a menace as it had been. Two ex-pat teachers had been killed a week ago on their bikes. Scott said it was not a rare event. 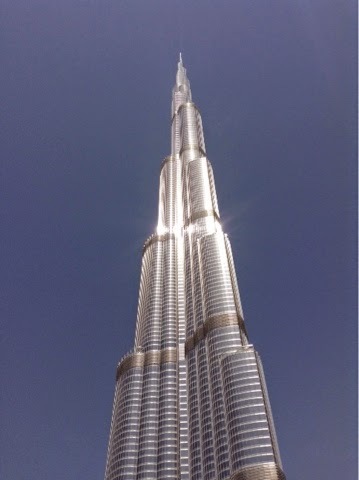 I was drawn once again to the Burj Khalifa, the world's tallest building. I hadn't had the time to give it a close look a month ago, as I was too preoccupied with the bike race. I had tried to swing by it but was thwarted by the superhighway system. Once I managed to get on the right road, which was not the easiest task, I found myself at its very entry, lined with spouting jets of water. A sprawling man-made lake extended beyond it, matching its excessive height and defying the region's natural desert environment. It could have been the world's largest swimming pool if swimming in it was permitted. If the tower was a monumental middle digital to the fates that had made this an impoverished desert until the discovery of oil just a few decades ago, this body of water was more of the same. Ostentatious villa restaurants and shops and accommodations surrounded it, companion pieces to the nearby luxurious Dubai Mall, further flaunting the oil riches of the Emirates. 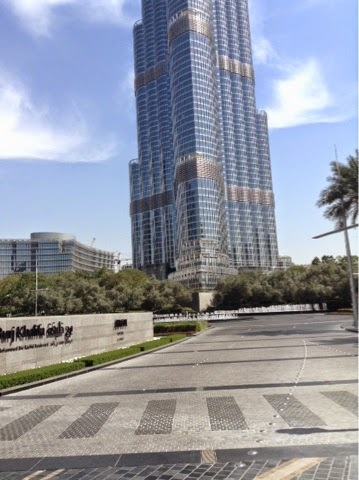 One had to strain one's neck to look up at the Burj and strain not to gag as one tried to wrap their mind around all this. One could be impressed or depressed at this flagrant grandiosity. Still infused with the peace and calm of all my time in the simple grandeur of the desert, I was suffering a severe case of culture shock. My final campsite the night before had been in an abandoned campground of palm frond partitions for motorists. It was too rustic to have succeeded. It came just before the sprawl of Dubai, Sharjah and Ajman with oil refineries nearby. Just as I was setting up my tent in the dusk I was surprised by a couple of young men, Bengalis they said. Anywhere else I would have been concerned that I had been discovered and that I ought to camp elsewhere or push on the final twenty-five miles to Scott's refuge. But they were friendly and nonthreatening. They said they lived just behind the encampment. A little while later they returned with a cup of tea and a biscuit. Sharjah calls itself the cultural center of the UAE. It has a large complex of art galleries exhibiting local, as well as international, artists, both living and dead. I spent a couple of hours wandering amongst them. The highlight was a thirty-three minute video on the Strait of Hormuz, just twenty-three miles wide, that separates Iran from Oman. It has become a major shipping lane as well as a major passage for small boats trafficking in licit and illicit goods such as tobacco and alcohol and oil going to Iran. The traffic has greatly intensified in the past few years, severely damaging the fishing that for centuries had been the livelihood for many. Just beyond the Art Center was the quite extensive Museum of Islamic Civilization. Gandhi had once been asked what he thought of Western Civilization. He said he was in favor of it. He might have said the same of this museum. It was intent on demonstrating how far ahead of the West the Islamic world had been. A time line claimed a Muslim was the first to attempt flight with a glider off a tower in 875. The Islamic world first used a windmill in 634, well ahead of Europe's first in 1180. Optics dates to 965 in the Islamic world, while the first mention of glasses in the rest of the world came in at Italian manuscript in 1289. The Chinese may have invented gun powder, but Arabia found new uses for it. The Islamic world was also at the forefront of astronomy with the first observatory outside Baghdad in 828. Muslims were concerned about time so they could be precise in when they engaged in their five daily prayers. One of the main galleries was devoted to explaining their religion, calling it the fastest growing religion in the world, embraced by twenty per cent of the world's population. There were quite a few videos and photos of the hajj, the annual Muslim pilgrimage to Mecca that is one of the essentials of the religion. Millions undertake it every year. The central mosque in Mecca has the capacity for one million worshippers on five levels, two of which are below ground. It is such a spectacle it is almost enough to make one convert to the religion to be able to part of this monumental event. One has to be granted certification to come to Saudi Arabia to participate. A huge tent city is erected to accommodate the millions. It is a several day event with many rituals. Pilgrims flying in must put on certain vestments even before their planes land. They must pick up stones and toss them at a holy obelisk and circle a huge rock seven times. The aerial view of the masses engaged in the pilgrimage dwarfed anything Hollywood could produce. I would have spent longer than the two hours I did in the museum if the air conditioning hadn't been so frigid. It was a good wrap-up to my time in the Islamic world. In my last visit to Morocco I was told on several occasions that I would make a good Muslim. They weren't proselytizing by any means, more words of praise and kindliness. But there was none of that here. People showed their respect and hospitality in countless other ways. As always, it has been a noteworthy journey. I saw much, but there is plenty more to entice me back. As I sit in the airport awaiting my flight gazing at all the Western-clad women with heads uncovered and baring flesh, I am already missing all the black-cloaked women mysteriously drifting along like apparitions. "I saw much, but there is plenty more to entice me back." How it left me also. But following your travels electronically has muted some of the urgency. And there are other places. Pleased you survived the traffic - to peddle on.